Sample from Parishes of Ireland. county, Poor Law Union and size. FindMyPast has added a collection of Indexes to Ireland's townlands and parishes. They date from 1851 to 1911, and are available to browse by dataset title and year. 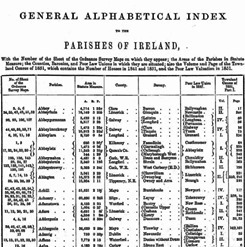 These alphabetical indexes were published in census years and provide land division details for each townland. As Irish records were organised by so many different divisions ie civil records by Poor Law Unions/ Superintendent Registration Districts, census by Electoral Divisions, it can be difficult for researchers to know the correct sets of records for their ancestor's place of origin or residence. These indexes make light work of the search. Free online databases of the information contained in some of these indexes are available elsewhere, if you know where to look, but having all of them accessible – and free to view – via FindMyPast will be handy for researchers.